Democrats suffered a demoralizing setback in Georgia this week as Republican Karen Handel easily defeated novice Jon Ossoff in a special House election widely seen as a referendum on President Trump. 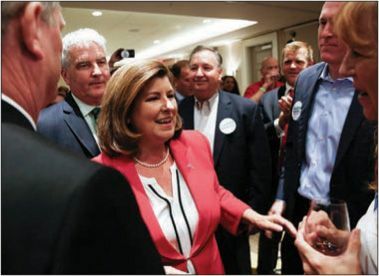 A former Georgia secretary of state, Handel scored a 52-48 victory in the 6th Congressional District, a suburban Atlanta seat formerly held by Health and Human Services Secretary Tom Price. Republicans have held the district since 1979, but Democrats had high hopes after Trump edged Hillary Clinton by just 1.5 points there in 2016. Ex–congressional aide Ossoff, 30, topped 17 candidates in an April election for Price’s seat, but fell just short of the 50 percent required for outright victory, forcing a runoff with Handel, 55. Their showdown drew national attention and became the most expensive race in House history, with candidates and outside groups spending $55 million. Ossoff ran as a centrist, but Republicans painted him as a liberal puppet who’d be controlled by House Minority Leader Nancy Pelosi and Hollywood celebrities who donated to his campaign. Handel, who scarcely mentioned the president during the campaign, focused on replacing the Affordable Care Act in her victory speech. “We need to finish the drill on health care,” she told supporters. If the GOP thinks it can now breathe easy, “it would be the height of hubris,” said the Washington Examiner. Republicans normally win this overwhelmingly white, middle-class district by 20-plus points. But the political landscape is shifting. In 2016, Republicans made gains among working-class voters in Northern and Midwestern states, but lost support among wealthier, better-educated whites. Somehow, they must build on blue-collar gains but hang on to the upscale voters. The Democrats only need 24 seats to win back the House in 2018—and 26 Republicans represent districts where Clinton won a larger share of the vote than in Georgia’s 6th. Cue the Democratic freak-out, said Jonathan Chait in NYMag.com. Ossoff’s defeat has dented party confidence because it feels like Democrats just can’t win. But the reason they’ve lost four special elections in a row is simply that all those contests were in heavily Republican districts. The good news is that Democrats overperformed by an average of 8 points in those races, enough to make them “solid favorites to win a House majority” in 2018.